I made these little cookie favors for my brother’s wedding this past summer (oh my gosh, remember summer?!) but they would work perfectly for Valentine’s Day! Just swap out the blue and white for pink and red and you’re good to go. They look more complicated than they are — all you need is a big batch of homemade sugar cookies shaped like hearts and a bowl of icing glacé (what’s that, you say? It’s like royal icing, but tastes better). Pipe a border of thickened icing around the edge of the cookies and let it dry. Then flood the center of the cookie with looser icing until it’s completely smooth. While the icing is still wet, pipe small dots in a different icing color around the border then immediately drag a toothpick smoothly through the dots until a chain of cute little hearts form! Now you can make sweet hearts for your sweetheart! Whisk powdered sugar and milk until smooth. Stir in corn syrup and extract and whisk until smooth (this should be a good flooding consistency — add more powdered sugar, 1 tablespoon at a time, until you reach the desired thickness for piping). Add food coloring as needed (gel food coloring works best). To quote…something I read on the internet…”January is the Monday of the year.” I am officially over it and fortunately, it is just about officially over. To show this frigid, awful month who’s boss, I made these killer Sweet and Salty Brownies from a favorite Brooklyn dessert cookbook. 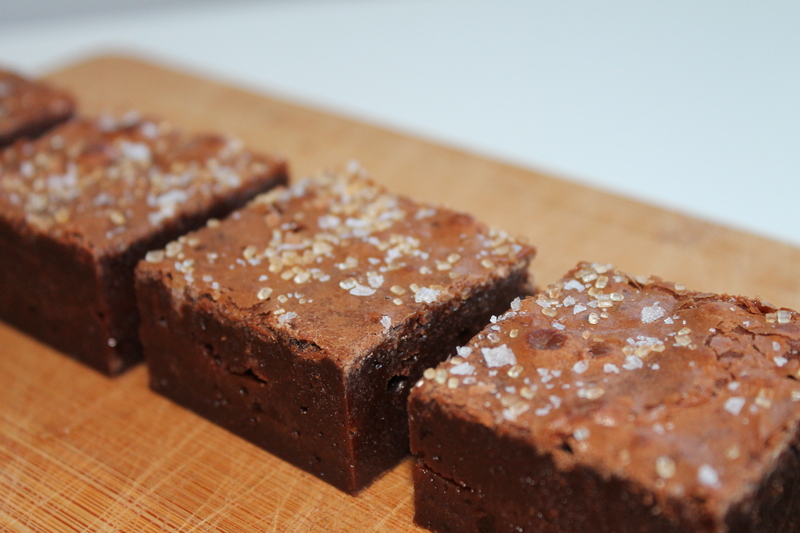 They’re dense, fudge-like brownies with a layer of homemade caramel in the middle and a sprinkling of flaky sea salt and coarse sugar on top. 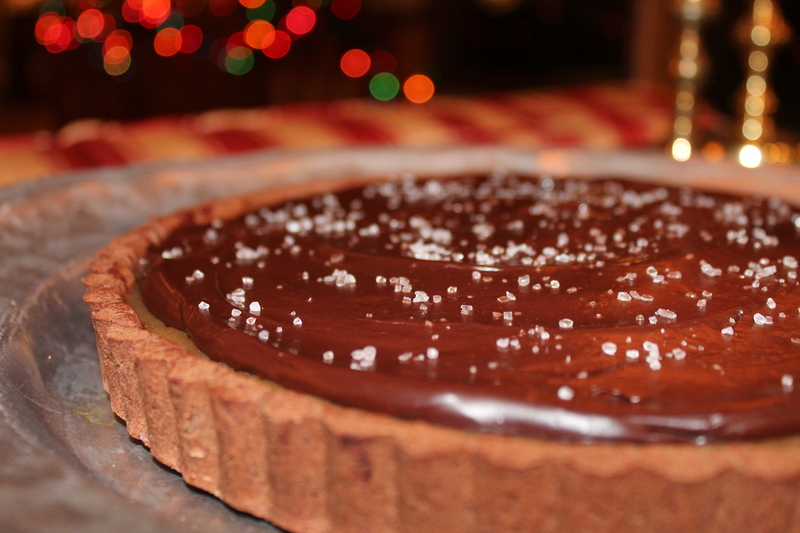 This Chocolate Caramel Tart was the perfect end to Christmas Dinner this year. It was rich, decadent, and ideal for celebrating. And speaking of celebrations, I didn’t even screw up the caramel! The crust is a simple chocolate dough that you press into a removable bottom tart pan — everyone should have one of these because it makes even the simplest desserts look extra fancy and complicated…it’s kind of like smudging flour on your nose…people think you did more work than you actually did. The caramel is pretty basic and as long as you pay attention to the sugar while it’s cooking, you’ll have a smooth, golden filling to go into the tart shell. Slathered on top of the caramel? Chocolate ganache. I know, it’s ridiculous. A sprinkling of sea salt seals the deal. But more important than this delectable dessert is the camera I used to take these pictures. That’s right, I am now the proud new owner of a Canon EOS Rebel camera thanks to my amazing cousin/sister/friend Hallie and her equally-amazing husband Matt. Just look at the quality of these photos! I’m obsessed. A very dear friend of mine got married this month and I had the honor of not only being a bridesmaid but also making her wedding shower desserts. When I initially asked her what her favorite flavors were, she panicked and could only think of chocolate and peanut butter (not a bad flavor combo to have in your back pocket…not literally though). She later emailed me with a list of favorite flavors and dessert ideas having perused this very blog. I decided to go with Chocolate Cupcakes with Peanut Butter Frosting, English Toffee Blondies (the groom is a Brit, after all), and Tiered Wedding Cake Sugar Cookies. I was quite proud of my handmade cupcake toppers — brown paper bags are a great secret weapon when it comes to crafting. I just punched out scalloped circles, stamped them with a heart on one side and ‘I Do’ on the other, taped them to toothpicks and tied them with a little red bow. I need professional help. Word of my dessert-making prowess has spread through the land (yay!) and I actually got commissioned to make treats for an old high school pal’s baby shower. This was very exciting because it is essentially my dream come true to make desserts for a living. The mom-to-be requested an autumnal theme to her baby shower desserts, so I went with Applesauce Spice Cupcakes with Honey-Cinnamon Frosting and a Gingerbread Cookie Topper (marked with a ‘B’ just like the old nursery rhyme…and it’s the baby’s initial! Kismet), Pumpkin Whoopie Pies, and the classic standby Sweet and Salty Chocolate Chunk Blondies. Those blondies are like the that crowd pleasing third cheese on a cheese plate that balances the whole thing out. Always a good choice. So happy to celebrate these momentous occasions with sweet treats! You know what’s better than a boring old cliché Halloween costume? An EDIBLE costume. That’s right, mustache cookies exist. Is it a disguise? Is it a chocolate-y treat? It’s both! I made these cookies last year for a best pal who needed them for a work event. We found these nifty mustache cookie cutters in one of those adorably quirky Brooklyn shops where you expect to see Zooey Deschanel working behind the counter. The cookie cutters are actually kind of cool (besides being shaped like mustaches which makes them inherently cool, duh) because on one side they cut the cookies into mustache shapes, but the other side has the mustache detail imprints that you press into the mustache-shaped dough. A good chocolate sugar cookie dough recipe would be perfect for this type of project. So if you need a last-minute costume or just a sweet treat, whip up a batch of mustache cookies! So apparently today is National Dessert Day, which is just ridiculous because, come on, every day is dessert day. If you’ve got yourself a bag of Oreos and a jar of peanut butter, boom, it’s dessert day. But it did inspire me to share some photos from the wedding shower for my brother and his lovely wife. Yes, they were married in August, and yes, the shower was in June, but we’ll just call it a laterblog or something catchy like that. The delayed timing also accounts for the abundance of fresh berries and general lack of pumpkin. Enjoy the eye candy consisting of Buckeye Brownies, Red Velvet Whoopie Pies, and the Berries and Cream tartlets. Happy Dessert Day! 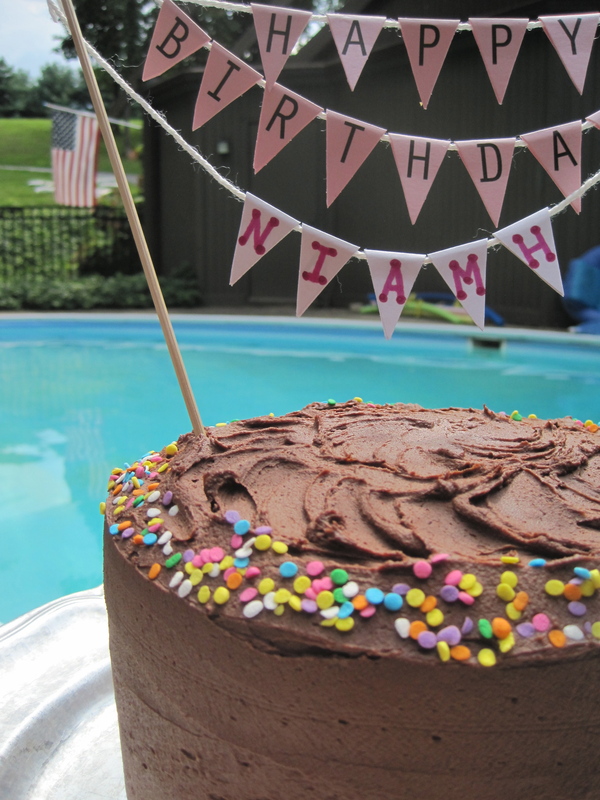 This summer we threw a surprise birthday pool party for my friend Katie’s awesome little sister Niamh (pronounced ‘Neeve’ — it’s Irish and beautiful, get used to it). It was a blast, even if it did make me feel old because these 10-year-olds are way hipper than I have ever been. To celebrate, I made a massive and decadent chocolate layer cake complete with a handmade Happy Birthday flag banner. We served it with little plastic cups of vanilla ice cream — the perfect poolside treat!